Angels do indeed come in fur suits. It's love at first sight...for both of them. An abandoned yet tenacious pup with one blue eye and one brown eye beats the odds and is enlisted as one woman's WINGDOG. It's a role he takes seriously, but he knows that his human needs more than just another set of eyes and ears. He must show her how to laugh and how to love again. His loyalty knows no bounds, and he takes his duties seriously riding shotgun as the pair travel life's highway. A dog may be man's best friend, but the truth is...A WINGDOG is truly a woman's gift. For readers who enjoy contemporary canine classics such as MARLEY & ME, THE ART OF RACING IN THE RAIN, and A DOG'S PURPOSE, Janelle Jalbert's 'Magical Mutt Memoir' combines the best of these storytelling traditions. Told as a memoir - adhering to how events unfolded - one woman seeks establish a new life after moving across the country from California to North Carolina. Her chance at a new normal arrives in the form of Goose, a pup that melts not only her heart but also the hearts of everyone that he meets. As they travel coast-to-coast and places in between, the bond that the two share proves that love and loyalty can transcend even the greatest of obstacles. Janelle Jalbert is an award-winning author of tales that promote the"Magic of Everyday Life". 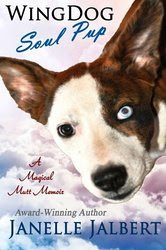 WINGDOG: Soul Pup, A Magical Mutt Memoir is her latest non-fiction release. Her latest fiction release, TRIANGULATING BLISS (Book 1 in the MYSTIQUE OF LIVING Series) is a tale of living life to the fullest and the cross genre fiction medalist in the 2015 New Apple Book Awards. She also has ghostwritten more than a dozen books,on a range of topics, for clients around the world and has worked as a copywriter for major international corporations. She is also the author of FLASH 40: Life's Moments - awarded the Silver Medal for anthologies at the 2015 Readers' Favorite International Book Awards - and WINE FOR BEGINNERS. During her ten year tenure as a teacher, Jalbert also worked as a motorsports reporter along with other pursuits. She currently resides in Southern California but is prone to wanderlust when her pack of pups allows it. I admit it. I love stories and books about animals. All animals. Hence, it was a natural for me to pick Wing Dog, Soul Pup by Janelle Jalbert to read and review. A dog may be a man’s best friend, but in this case, a dog turned out to be the author’s best friend and soul pup. Jalbert is a Southern California transplant who relocated to North Carolina. That alone brings with it a bit of culture shock. Alone in the south, she needs a bit of guidance and comfort. Enter Wing Doug, a pup she adopts and immediately goes to making her life less lonely. Written with feeling from the heart, Jalbert does a great job of bringing her tale to life. With a bit of humor, love and style, Wing Dog, Soul Pup touched my heart. It made me laugh and cry. It made me snicker and smile. If you love a good story, particularly one involving animals, may I suggest this tale of soul? Add to it a bit of Wing Dog. Until next review, stay safe. Smile! Be happy! Show compassion to others. Be nice to one another. Be a voice for the voiceless! Read a book and pass it on. Review it. Cheers!